‘What, So What, Now What’ helps by asking us to step back and consider what is going on. By doing this with others, we are encouraged to discover the gaps in our understanding by learning from their perspectives. Being a fairly simple structure, you can easily adapt it to suit the needs of the situation. And the more you do it, the more natural this structured approach to sense-making becomes. As part of a Sprint Review to digest and make sense of what was delivered during the past Sprint and any feedback that was received, and decide on next steps together. To reflect on a critical incident or a team conflict together with the people involved and/or impacted, either during a Sprint or during a Sprint Retrospective. Together with developers, to determine what strategies to use for optimizing codebases or reducing technical debt. As part of a Sprint Retrospective where members of a team are invited to reflect on how the team worked together and went about their Sprint. To periodically reflect on how the organization is doing in their Agile journey. Invite teams and stakeholders and invite them to reflect on the process so far. A team engaged in a ‘What, So What, Now What’ as part of their Retrospective. We gathered the output per round on post-its (partially visible on the glass wall behind the team). 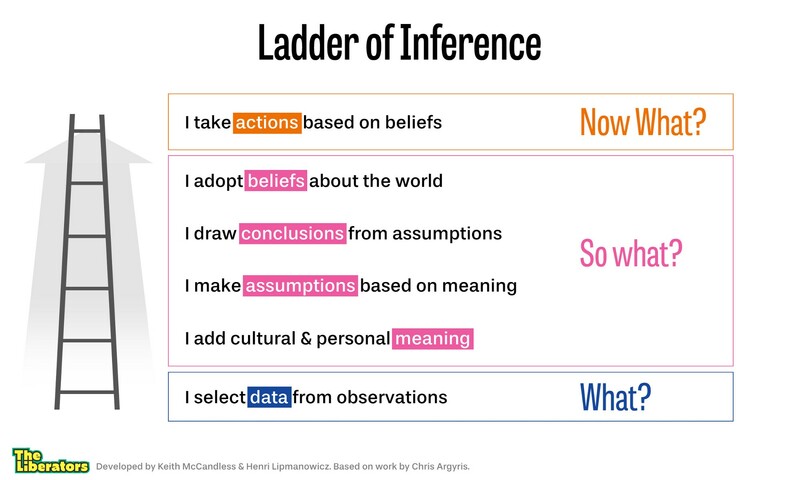 We used printed hand-outs of the Ladder of Inference to help the group navigate the rounds correctly. Use Appreciative Interviews to share stories about a successful Scrum Team that you’ve been part of. Follow-up with W3 to determine the patterns, key conditions and next steps. 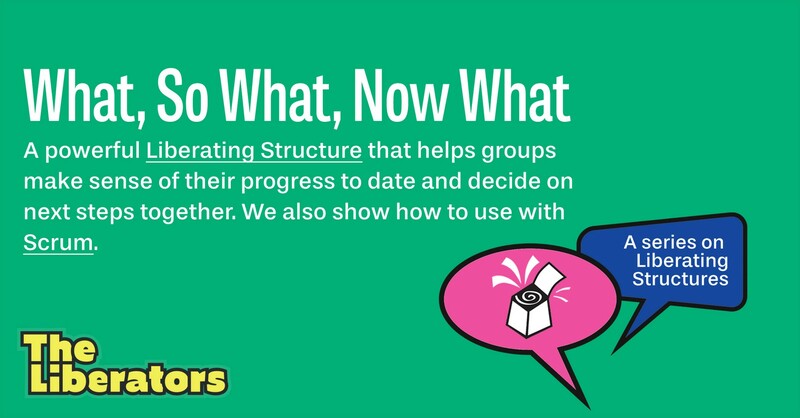 In this post, we explained the Liberating Structure, What, So What Now What, and how we use this structure within the context of Scrum. Give it a try! We’re always happy to hear your experiences or hear your suggestions. If you’d like to know more about Liberating Structures or experience a large number of them first-hand, make sure to join our Immersion Workshop in Amsterdam (December 10 & 11) or one of the others taking place in Europe in that month. Or join the Dutch User Group to give and get help from other users.